Can a Landlord Check a Tenant's Credit? Landlords are allowed to screen prospective tenants for their rental. Many landlords include a credit check as part of this screening process. A tenant’s credit history can help you get a better picture of the tenant’s financial situation. Learn the steps you must take before running a credit check and the pros and cons of this information. Check a Prospective Tenant's Credit? Yes. Landlords are legally allowed to run a credit check on a prospective tenant. However, the prospective tenant must be made aware that the landlord will be checking their credit. The landlord must get the tenant's written permission in order to legally run this check. Clause in Rental Application: The landlord can include a clause at the bottom of the rental application form which serves the purpose of obtaining a tenant's written permission. For example, the clause could state that by signing this form, the prospective tenant is consenting to a credit check. Separate Document: If the landlord prefers, he or she can create a separate credit check consent form for the tenant to sign. By signing this form, the applicant is allowing the landlord to obtain a copy of the tenant's credit history. A credit check can be an essential part of the tenant screening process. It can give you a good picture of the applicant's financial situation and their ability to pay rent on time. Covers Long Period of Time: ​A credit report typically covers a seven to ten year period. Therefore, it will give you a picture of the tenant's past and current credit history. Provides Useful Information: On the credit report, you can see if the tenant has ever been evicted if they are drowning in debt, if they are late or delinquent on their bills or if they are involved in any sort of a lawsuit. While a credit check can be useful when selecting a tenant for your rental property, there are potential issues you need to be aware of. You need to be sure that you are running the check legally and that you are analyzing the information provided intelligently. Failure to Get Written Consent: ​You must get a tenant's written consent before running the credit check. If you fail to do so, you may not be able to use the information that you have gathered from the report and the tenant may be able to take legal action against you. Qualifying Standards: ​The credit check must be part of the qualifying standards you have for all tenants. You cannot run credit checks on one race of people and not on another. You cannot require a certain credit score for one race of people and a higher credit score for another race. 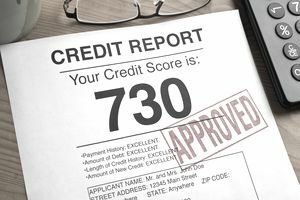 Don't Rely Solely on This Information: ​The information you gather from a credit report is useful, but you should not use it as the only means of selecting a tenant. There are professional tenants who supply false information. Other good tenants may have fallen on hard times. You should always ask the tenant questions about the information that comes up on the report because it might not be accurate. Too Young to Establish Credit History: Some prospective tenants may be too young to have established a credit history. These individuals could still be great tenants. In these cases, you may be able to have a parent or relative co-sign the lease if you are concerned about payment.